If you need a sharp and reliable knife, going with ceramic knives is always a good idea. 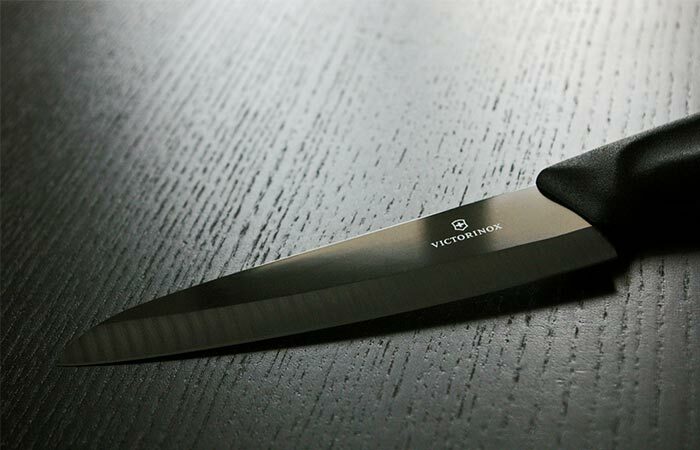 Victorinox is well known for crafting high-quality knives and if you’re a person who loves to cook and does it often than you should check out their Ceramic Carving Knife. Whether you’re carving roasted meat, deboning chicken or chopping veggies, this knife will be of great use. First of all, it’s incredibly sharp. It’s made from Zirconium Dioxide which is two times harder than steel and remains sharp for longer periods of time. Also, the material won’t corrode or cause the cut surface of fresh fruits and veggies to oxidize. Victorinox Ceramic Carving Knife is made from Zirconium Dioxide, making it incredibly sharp and hard. Ceramic knives weigh almost half as other steel knives do. Together with the ergonomic handle and laser-tested cutting angle, Victorinox Ceramic Carving Knife will turn your carving performance to a professional level. Another important feature is that this knife is odorless and tasteless. It weighs 148g and has a 15cm blade length.